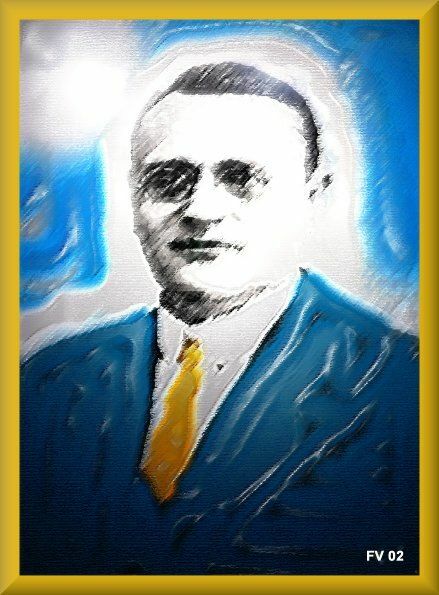 In the previous lectures we have been considering man as a unit, showing how man, a Spirit, has several bodies, or vehicles of consciousness besides the dense body, and how he uses these bodies in gathering experience as a workman uses tools; how experience is garnered in each life and assimilated between death and the next birth, so that in each new Earth-life, we have as faculty the sum of all our experience in our former lives; and how we are thus progressing towards the glorious goal of perfection, which all will eventually attain before we cease returning to this Earth, were each life in a dense body is as a day at school to a child. When we have learned all that is to be learned here, there are other and higher evolutions that we may enter, just as a child enters the grammar school after passing through kindergarten. Endless progress is before the Ego, limitations are unthinkable, for the human Spirit is a spark from the Infinite, enfolding all possibilities. Man is not only a unit, a separate entity, however; at least, he is that only in a relative sense, for he is a member of a family, a community, a nation, one of the inhabitants of the Earth, and through that related to other worlds with their inhabitants, for they are all inhabited, as some astronomers, arguing from analogy, have asserted. Occult science also teaches that they are inhabited, and this teaching is founded on firsthand knowledge, gained and verified by means of faculties possessed by some, though as yet latent in the many. This relation of the Sun, Moon, and planets is shown in every one of the different world religions, the Christian religion included, and the olden temples are monuments to the faith now nearly forgotten in the Western World; yet as relevant today as in the days of old. 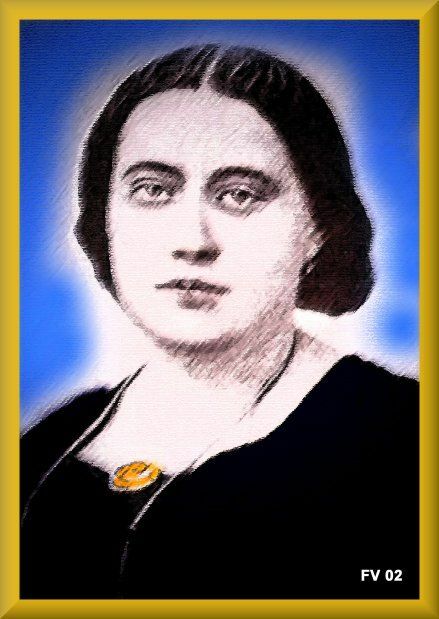 H. P. Blavatsky in THE SECRET DOCTRINE tells us that the construction of the pyramids was based on the program of the Mysteries and of the series of Initiations...hence the Pyramids are the everlasting record on Earth of these Initiations "as the course of the stars are in heaven." The cycle of Initiation was a reproduction in miniature of that great series of cosmic changes to which astronomers have given the name of...sidereal year (25,868 ordinary years). 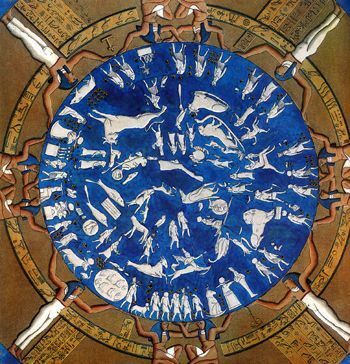 "Just as, at the close of the cycle of the sidereal year (measured by the precession of the equinoxes round the circle of the zodiac), the heavenly bodies return to the same relative positions...so, at the close of the cycle of Initiation, the inner man has regained the pristine state of divine purity and knowledge" from which he departed to perform the pilgrimage through matter, but RICHER BY THE EXPERIENCES HE HAS GONE THROUGH. Being a symbol, it must of course embody all, or at least a part of the most prominent features of the things symbolized; and thanks to the able, if somewhat narrow-minded works of Professors Piazzi Smith and Proctor, both astronomers of repute, but ranged on opposite sides in regard to the question concerning the use of the Pyramid--we have an overwhelming amount of proof of the relation of the measurements of the different parts of the Pyramid to terrestrial and cosmic cycles and distances. Professor Proctor's testimony is the most valuable, because he is a dissenter from the theory that the Pyramid was constructed by divine architects; and would do, and does do anything he can, in honor, to refute such a theory, attributing the numerous measurements which he works out, and their relation to cosmic measures to "mere coincidence"; a method which caused Mme. Blavatsky to vent her rare sarcasm upon him, as "the champion coincidentalist." 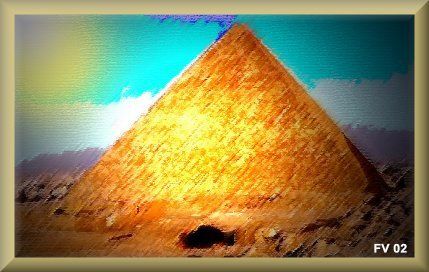 He admits that "all the theories concerning its origin leave unexplained the most striking features of the Great Pyramid, save the one wild (?) theory which attributes its construction to divine architects"...also that "the theory that it was used for astrological purposes is supported by all known evidence, and strong though that support is, it derives greater strength from the failure of all other admissible theories to sustain the weight against them." In another place he admits that the only difficulty with the astrological theory arises from "our inability to understand how men ever had such fullness of faith in astrology as to devote many years of labor and enormous sums of money to the pursuit of astrological researches, even for their own interests." Proclus tells us that according to tradition the pyramid ended at one time in a platform, with the head of the grand gallery projecting upward from the center, and Professor Proctor grows enthusiastic over the possibilities of the Pyramid as an observatory when in that architecturally unfinished, but astronomically perfect state, closing his eulogy by saying that "given modern instruments" it might have remained the most important astronomical observatory in the world. He shows how the opening of the grand gallery points to the zodiac, so that as the Sun, Moon, and planets pass around their course in the heavens, they would throw a shadow into the grand gallery at a different angle for each day of the year or month and that thus their positions could be measured in a most efficient manner. Each side measures 913.15 inches at the base; thus the sum of the 4 sides is 36,526 inches. Allowing 100 inches for each day in the year, gives us 365 1/4 days, or exactly the number of days in a year, even to the quarter day which we save up for four years and use in the leap year. The length of one of the diagonals of the base is 12,934 inches, so the sum of them both is 25,868 inches or 1 inch for every year in the great sidereal or world-year. As the base of the Pyramid measures the time it takes the Earth to revolve around the Sun in its yearly course, it would be a fair inference that the height of the Pyramid ought to measure the distance of the Earth from the Sun and it does. The height of the pyramid is 5,819 inches. That multiplied by a thousand million inches equals 91,840,000 miles, which Professor Proctor admits is more likely the true distance of the Earth from the Sun, than any calculated by the astronomers. Therefore, "wild theory" or not, the evidence is all in favor of the supposition that divine architects built the pyramid, and that ought to convince us of this theory. At a later period in its history, occult information tells us that the Pyramid was the temple of the mysteries which have now degenerated into "Masonry." In one of the rites called "the gate of death," the candidate was tied to a wooden cross and carried into a subterranean crypt, where he remained entranced for three and one-half days. During that time, while his dense body lay inert, the Ego, clothed in its finer vehicles, was consciously roaming the Desire World in the hierophant's charge. He was put through the "trials by fire, Earth, air, and water." That is, he was shown that when functioning in such a body none of the elements could harm him; that he could then pass through a mountain as easily as through air; that he could live in a roaring furnace or on the bottom of the Great Deep in perfect ease and comfort. At first the neophyte is usually afraid of the elements, therefore the initiator is present to help and give assurance to the neophyte. At sunrise on the fourth day, he was carried to the platform of the Pyramid, where the rays of the rising Sun woke him from his sleep (during which he had been visiting Purgatory). When awakened, he was given "the Word," and was called "first-born." This rite lingers yet as the third degree in Masonry; the death and resurrection of Hiram Abiff, the "Widow's son," the Grand Architect of Solomon's temple and hero of the Masonic legend. 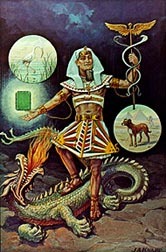 Dragon, the eminent French Masonic authority, says that the legend of Hiram is an astronomical allegory representing the Sun from the summer solstice downward. "During the summer the Sun calls forth songs of gratitude from all that breathes, hence Hiram who represents it, can give the Word, that is to say LIFE to all. Then the Sun enters the southern signs at the fall equinox, nature becomes mute, and Hiram, the Sun, can no longer give the sacred Word; he meets the three murderers: the zodiacal signs Libra, Scorpio, and Sagittarius, which the Sun goes through in October, November, and December. The first strikes him with a 24-inch rule emblematic of the 24 hours the Earth takes to revolve on its axis. The second strikes him with an iron square, symbolizing the four seasons, and at last the mortal blow is given by the third murderer with a mallet, which, being round, signifies that the Sun has completed its circle and dies to give room for the Sun of another year." The initiates of the temples in Egypt were called "phree messen" which means "children of light" because they had received the light of knowledge, and it is this which has been changed into "Free Mason." In the religion of Judaism we hear of a God making certain promises to a man by the name of Abraham. He promised that he would make Abraham's seed as numerous as the sands upon the seashore; and we are told how he dealt with Abraham's grandson, Jacob, who was the husband of four wives, by whom he had 12 sons and one daughter. These are looked upon as the forefathers of the Jewish nation. This also is an astronomical allegory dealing with the migration of the heavenly bodies, as will be evident from a careful perusal of the 49th chapter of Genesis and the 33rd chapter of Deuteronomy, where the blessings of Jacob upon his sons show how they are identified with the 12 signs of the Zodiac; Simon and Levi sharing the sign of Gemini, the twins, and the feminine sign Virgo being allotted to Jacob's only daughter, Dinah. The four wives are the four phases of the Moon and Jacob is the Sun. This is similar to the teaching we find among the Greeks, where Gaia, the Earth, is the wife of Apollo, the Sun; and among the Egyptians, where heat and moisture, the Sun and the moon, were personified as Osiris and Isis. The sacred rivers Jordan and Ganges are also connected etymologically with the river Eridanus, which is one of the constellations. It means "source of descent," and for agriculturists such as were these ancient people, these rivers were the source of the waters of life. 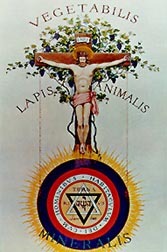 Josephus tells us that the Jews carried the 12 signs of the Zodiac on their banners, and camped around the tabernacle which held the seven-branched candlestick representing the Sun and the heavenly bodies which move inside the circle formed by the 12 signs of the Zodiac. The Jews located their temples so that the four corners pointed N.E., S.E., S.W., and N.W., and the sides directly North, East, South, and West, and like all solar temples the main entrance was in the East, so that the rising Sun might illumine its portal and herald each day the victory of light over the powers of darkness; this to bring to the nascent humanity the message that the contest of light and darkness on the material plane is but the counterpart of a similar contest in the moral and mental worlds where the human soul is groping its way towards the light, for the battle of light and darkness in the material world, like all other phenomena, is a suggestion of the realities in the invisible realms, and these truths were given to man as myths by divine leaders who led him until his growing intellect gave birth to arrogance which caused his benefactors to withdraw, and let him learn by the hard knocks of experience. Then he forgot them and has come to regard the ancient stories of gods and demi-gods as imaginary. Yet, even the early Christian church was imbued with this knowledge of the significance of the solar myth, for the Cathedral of St. Peter at Rome is built facing East, like all other solar temples, telling humanity of the "Great Light of the World" who is to come and dispel the spiritual darkness which as yet envelops us; the Light-bringer who shall bring peace on Earth and good will among men, causing the nations to beat their swords into plough-shares and their spears into pruning-hooks. The Jews greeted the Sun with the Morning-sacrifice; and took leave of him at sunset in a similar manner by an evening oblation, offering up on their sabbath and additional sacrifice to the lunar "Race-god," Jehovah. Him they also worshiped by sacrifice at the New Moon. One great feast was Easter, when they celebrated the Passover; the time when the Sun "passes over" his "easter(n) node; leaving the southern hemisphere where he winters and commencing his northern journey in his chariot of fire, hailed with joy by men as their savior from hunger and cold which would inevitably result if he stayed in south declination always. The last of the Jewish feasts and the most important is the feast of the Tabernacles, when the Sun crosses its western node in autumn, having yielded to man the "bread of life" wherewith to sustain his material being until the next return of the Sun to the northern heavens. For the above reasons the six southern signs which the Sun occupies in winter are always called "Egypt," the "land of the Philistines," etc.-- a name for something that is bad for "God's people"; whereas the northern signs in which the Sun is in the fruitful season are "heaven," "the promised land," which "flows with milk and honey." We see this in such passages as the one where the celebration of the Passover is enjoined "to remember the coming out of Egypt." This feast is a rejoicing over the emergence of the Sun from the southern signs, also from the recorded fact that Jacob was with Joseph in Egypt when he died. At the winter solstice when the Sun of the past year has completed its journey and reached its lowest degree of south declination it is in the zodiacal sign Sagittarius. By reference to Genesis 49:24 where the dying Jacob speaks of the "bow" of Joseph, it is easy to identify him with the sign Sagittarius which represents a centaur in the act of drawing his bow, and thus the story of Jacob dying in Egypt with Joseph, is reenacted each year when the Sun dies in the sign Sagittarius at the winter solstice. The story of Samson is another phase of the solar myth. As long as Samson's hair was allowed to grow, his strength would increase; Samson is the Sun, and its rays represent Samson's hair. From the winter solstice in December to the summer solstice in June the Sun's rays grow, and he gains in strength with every day. This frightens the "powers of darkness," the winter months, the Philistines, for if this Light-bringer continues to reign their kingdom will come to an end; and they counsel together against Samson to discover wherein his strength lies. They secure the cooperation of the woman DELILAH, which is the sign Virgo, and when Samson, the Sun, passes through that sign in September he is said to have laid his head in the woman's lap, and to have confided his secret to her. She shears him of his locks, for at that time the rays of the Sun grow shorter, and lose their strength. Then the Philistines or winter months come and carry the debilitated giant into their prison: the southern signs where the Sun is in winter. They put out his eyes or deprive him of his light and at last bring him to their temple, their stronghold, at the winter solstice; there they subject him to infamous indignities, believing they have vanquished the light completely, but with his last remaining strength the fettered solar giant shatters their temple and although he dies in the effort, he overcomes his enemies and thus leaves the way clear for another Sun-child to be born to save humanity from the cold and famine which would result if he had remained bound in the toils of the powers of darkness, the Philistines, the winter months. The lives of all the saviors of mankind are also founded upon the passage of the Sun around the circle of the zodiac, which pictures the trials and triumphs of the initiate, and the fact has given rise to the erroneous conclusion that these saviors never existed, that the stories are merely Sun-myths. This is wrong. All divine teachers sent to man are cosmic characters, and the ordering of their lives is in accord with the marching orbs, which contain, as it were, an anticipated biography of their lives. Each came with divine spiritual light and knowledge to help man to find God, and therefore the events in their lives were in accord with the events which the physical light-bearer, the Sun, encounters on his pilgrimage through the year. 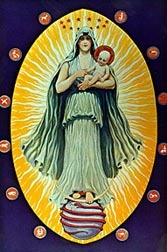 The Saviors are all born of an immaculate Virgin, at the time when darkness is greatest among mankind, as the Sun of the coming year is born, or begins his journey, on the longest night of the year, when the zodiacal sign Virgo, the Virgin, stands on the eastern horizon in all latitudes between 10 and 12 P.M. She remains as immaculate as ever, after she has given birth to her Sun-child; hence we see the Egyptian goddess Isis sitting on the crescent moon nursing her divine Babe Horus; Astarte, the immaculate lady of Babylon, with her babe Tammuz and a crown of seven stars over her head; the lady Devaki in India with her infant Krishna, and our own Virgin Mary giving birth to the Savior of the Western World under the star of Bethlehem. Everywhere the same story: the immaculate Mother--the divine Babe--and the Sun, Moon, or stars. As the material Sun is weak and has to flee from the powers of darkness, so all thee divine light-bringers are searched for and forced to flee from the powers of the world; and like the Sun, they always escape. Jesus fled before King Herod. King Kansa(4) and King Maya are his counterparts in other religions. The baptism occurs at the time when the Sun passes through the sign Aquarius, the Waterman, and when he goes through the sign of the Fishes in March we have the fast of the Initiate, for Pisces is the last of the southern signs, and all the stores laid by from the bounteous gifts of the Sun of the previous year and nearly exhausted, and man's food is scant. The fish-food of Lent which occurs at this time is a further corroboration of this solar origin of the fast. At the vernal equinox the sun "CROSSES the equator" and at that time the "CROSSification" or crucifixion occurs, for then the Sun-god commences to give his life as food for his worshipers, ripening the corn and the grape, which is made into the "bread and wine." To do that he must leave the equator and soar heavenward. Similarly it would benefit humanity nothing spiritually if their saviors stayed with them, therefore they soar heavenwards as "sons (or suns) of righteousness," ministering to the faithful from above, as the Sun does for man when high in the heavens. The Sun attains its highest point of north declination at the summer solstice; he then sits upon "the throne of his father," the Sun of the previous year; but he cannot remain there more than three days, then he is carried downwards towards his western node. Likewise the Saviors of mankind ascend to the throne of the Father, to be reborn from time to time for the good of mankind, which truth is embodied in the sentence of the Nicaean creed: "thence he shall return." The movement known as the "precession of the equinoxes," whereby the Sun crosses the equator on the 21st of March at a different point each year, determines the symbol of the Savior. At the time of the birth of Jesus the Sun crossed in about the 5th degree of the sign Aries, the Ram. Consequently Christ was "the lamb of God." There was a dispute, however. Some thought that owing to what is called the orb of influence, power of the Sun was really in the sign Pisces, the fishes, and that the symbol of Christ should have been a fish. As a relic of that dispute we see that to this day the Bishop's miter is in the form of the head of a fish. At the time of Mithras, the Persian Savior, the Sun crossed in the sign of the Bull, hence we find Mithras riding on a bull, and this was also the foundation for the worship of the Bull Apis in Egypt. At present the vernal equinox is in about 10 degrees of Pisces, the fishes, so that if a savior were born now he would be a "Fish-man" like Oannes of Nineveh, corrupted into Jonah and the whale by the Bible. The four letters said to have been on the cross of Christ and the method of fixing Easter in commemoration of the event, also go to show the cosmic character of the occurrence; these letters, I.N.R.I., are commonly supposed to have meant Jesus Nazarenus Rex Judaeorum, but they are also the initial letters of the Hebrew names of the four elements: Iam (water), Nour (fire), Ruach (air or spirit), Iabeshah (Earth). It would be foolish to fix the anniversary of the death of an individual as Easter is fixed by the Sun and Moon, but it is the proper thing in respect of a solar festival and a cosmic character, related to the sun as spiritual light-bringer to physical luminary. When the Sun leaves his throne at the summer solstice, June 21, he passes into the sign Leo, the Lion of Judah. Then we have the Catholic feast of the "Assumption" on August 15, in Leo. Thence, onward to his western node, he enters the sign of the Virgin about August 22. Thus the Virgin is born from the Sun as it were. This brings to mind the astronomical solution to that passage in Revelation, "I saw a woman clothed with the sun and the moon under her feet." That phenomenon happens every September just after the new Moon; for viewed from our Earth, the Sun covers or clothes the sign Virgo all through September, and as the Moon is leaving the conjunction of the Sun, that appears to be beneath the Virgin's feet. When John the Baptist is represented as saying concerning Christ that "he must increase, but I must decrease," he is symbolizing the Sun at the summer solstice when it must decrease in light for the coming half year, while Christ by his birthday at Christmas is identified with the newborn Sun which increases the length of the day until the middle of summer. Thus we see that the contest of Light and Darkness in the physical world is closely connected in the scriptures of the different religions with the contest of the powers of spiritual light and life against those of darkness and ignorance; that this truth is universally spread among all peoples in all ages. The myths of the dragon-slayers embody the same truth, where the Greeks tell of the victory of Apollo over Python, and of Hercules over the dragon of the Hesperides, the norseman tells of the contest of Beowulf slaying the fire-drake, of Siegfried slaying the dragon Fafner, and of St. George and the dragon. In our materialistic age these truths are temporarily relegated to oblivion or regarded as fairy stories without any basis in truth; but the time will come and is not far distant when these relics will again be restored to honor as embodiments of great spiritual truths. The Great Pyramid stands upon a limestone plateau at the base of which, according to ancient history, the Nile once flowed, thus supplying a method of transportation for the huge blocks used in its construction. Presuming that the capstone was originally in place, the Pyramid is, according to John Taylor, in round figures 486 feet high; the base of each side is 764 feet long, and the entire structure covers a ground area of more than 13 acres. The Pyramid contains four chambers. The King’s Chamber is an oblong apartment approx. 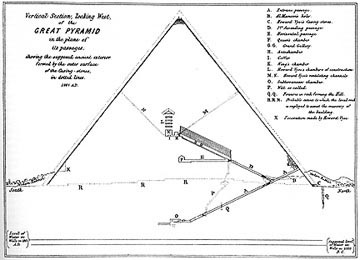 39 feet long, 17 feet wide, and 19 feet high, with a flat roof consisting of nine great stones, the largest in the Pyramid. Above the King’s Chamber are five low compartments, generally termed construction chambers. In the lowest of these the so-called hieroglyphs of the Pharaoh Cheops are located. The roof of the fifth construction chamber is peaked. At the end of the King’s Chamber opposite the entrance stands the famous sarcophagus, or coffer, and behind it is a shallow opening that was dug in the hope of discovering valuables. Two air vents passing through the entire body of the Pyramid ventilate the King’s Chamber. In itself this is sufficient to establish that the building was not intended for a tomb. (4) Kansa: In Hindu mythology, a king of Mathura, son of Ugrasena and sec- ond cousin of Krishna. (5) Occult science teaches that nature spirits are evolving beings who build the plants, form the crystals of the rock, and with numerous other hierarchies are working around and about us unseen, but nevertheless busy in mak- ing that which we call nature. (6) A group spirit is an entity functioning in the spiritual worlds and pos- sessing a spiritual body composed of many separate animal spirits, as a man has a body composed of many cells, each with an individual consciousness. The group spirit itself cannot function in the physical world, but it evolves by sending the different animal spirits into a form of body which it creates.